Stop us if you've heard this one before: Online retailing has mushroomed throughout the consumer world and will soon render a franchised dealer structure antiquated and irrelevant. In late February, Tesla announced it was shifting to an online-only sales model, which may be one small step for the company, but it could be the first of more seismic shifts for automotive retailing, pushing the industry into online sales before it is ready. Or Tesla's move may be a flailing swing from a niche car company, one in the throes of a cost-cutting strategy, and a move that sends few ripples throughout the broader industry. Right now, it's hard to tell which is the case. The details of Tesla's burgeoning online operation, which will provide insight as to whether the online-only sales violate franchise and licensing laws that often require physical locations, are unknown. Tests of those state-by-state laws will certainly determine whether other upstarts, such as Rivian and Byton, can utilize similar methods. Legal challenges could take years to unfold. Before he backpedaled on March 10, Tesla CEO Elon Musk was brimming with confidence. "Going to online-only is incredibly helpful to us for selling anywhere in the U.S.," Musk said in a conference call with reporters in February. "In many parts of the U.S., we can't sell because of franchise laws, whereas if sales are concluded now online, anyone in the U.S. can buy the car immediately. I think this really, substantially, opens up our ability to sell the cars. It's 2019. People just want to buy things online." 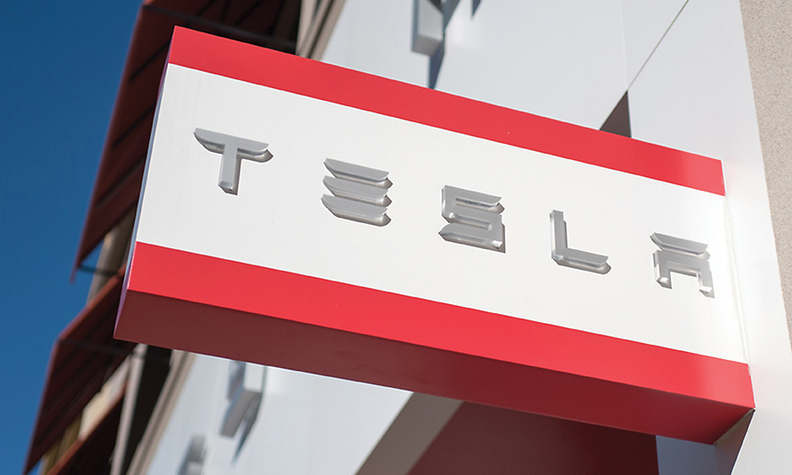 Simon Bradley, global practice director at consulting firm Urban Science, says online-only sales are ill-suited for most dealers but could be done successfully by the likes of Tesla. "One thing Tesla has going for it that no other OEM has is fixed pricing," he said. "The retail price of the vehicle is the same no matter what point you buy it from in the Tesla network, and when you reach that point, you can entertain online sales in the manner Tesla is doing. For other OEMs, they'd need to at least get to a point where consumers feel like they're getting value from the brand. But the online model works for Tesla because of fixed pricing and their product. They're still the Apple of the car world." But even Apple still has brick-and-mortar stores, more than 500 across the globe as of December, the latest count. And the number continues to expand, per the company's latest regulatory filing. Apple says the retail stores "are designed to simplify and enhance the presentation and marketing of the company's products and related solutions." Tesla may have realized that without a similar touch point, the automaker could sever a critical link in its relationship with customers. Tesla on Feb. 28 said it would keep a small number of stores open. Ten days later, it said it decided to keep more stores open than originally planned but would still require customers to buy online. That jibes with suggestions from analysts. Morgan Stanley's Adam Jonas said a more prudent step would be moving toward something like a pilot project that examines the removal of stores in a particular area or state rather than a national overhaul. Tesla is in "uncharted territory for a company that used to highlight its advantages in engaging with customers and promoting its brand experience in a direct way through its stores," he wrote in a research note emailed to investors. "While we can see a way for the move to cut stores to save money upfront — mainly through lower labor costs — there is unquantifiable risk that the move could impair the company's ability to service its growing fleet of vehicles." That is why most dealers can't go online-only. Without the brand power that Tesla has, other brands rely on dealerships to provide a place for customers to come in and experience cars and trucks they may not already be familiar with. "The consumer base is not demanding digital retail," said David Metter, founder and president of AutoHook, part of Urban Science. "Even millennials want the experience you get at a dealership." But Tesla may need to reduce storefronts to cut costs. The electric vehicle maker said online-only sales would enable it to trim its work force. However, Tesla said the decision announced March 10 to keep more storefronts open means it will need to raise vehicle prices. But it will keep selling a version of the Model 3 at the long-promised price of $35,000. Musk said the company would be "significantly increasing head count" in technicians to address those service concerns. Improved customer service remains perhaps the company's most important priority for 2019. Previously, Tesla stocked parts at warehouses instead of service centers, which lengthened the time it took for repairs to be made and frustrated customers. They'll now be stored at service centers to allow for more rapid repairs. Musk envisions a system in which repairs are made in as little as 15 minutes. That could indeed lead to what he called "amazing" service that motorists appreciate, but it could come with financial trade-offs. "If you want a convenient network to service Tesla vehicles, you need 1,000 points, as a rough number, to do that," Urban Science's Bradley said. "So how they get there, what partner they select as a service provider, that's going to be intriguing. ... I'm trying to figure out how that's going to work profitably. Unless they just charge an incredibly high amount for service." If logistics are one major challenge for transitioning to online sales, legality might be another potential roadblock. Franchise laws regulate the sale and distribution of new vehicles. In some states, Tesla has secured dealer licenses, or their equivalent, to sell its vehicles directly to consumers. Other states, such as Michigan and Connecticut, prohibit manufacturers to be licensed as dealers. In those cases, Tesla generally conducts sales out of state, and the buyer can then register the vehicle in their home state. Sometimes, Tesla operates stores that function as showrooms, and they serve as brand anchors even if no sales are allowed to take place on the premises. Those flagship showrooms could underpin Tesla's future relationships with customers. While the company had intended to continue operating a small number of outlets in high-traffic locations, its March 10 announcement means it will now keep "significantly more" open than previously planned. Those outlets will offer customers test drives and guidance on how to order on their phone. A limited inventory will be kept for buyers who want to drive away in their new Tesla. Musk said approximately 80 percent of shoppers purchase vehicles without even taking a test drive, so it made sense for the company to whittle its sales force. While the specifics of legal challenges to such arrangements remain uncertain and vary by state, Musk broadly seems eager to renew his long-running feud with franchise laws and the traditional franchised dealership structure. "I'm sure the franchised dealers will try to oppose this in some way," he said. "But to do so would be a fundamental restraint on interstate commerce and violate the Constitution. So good luck with that." 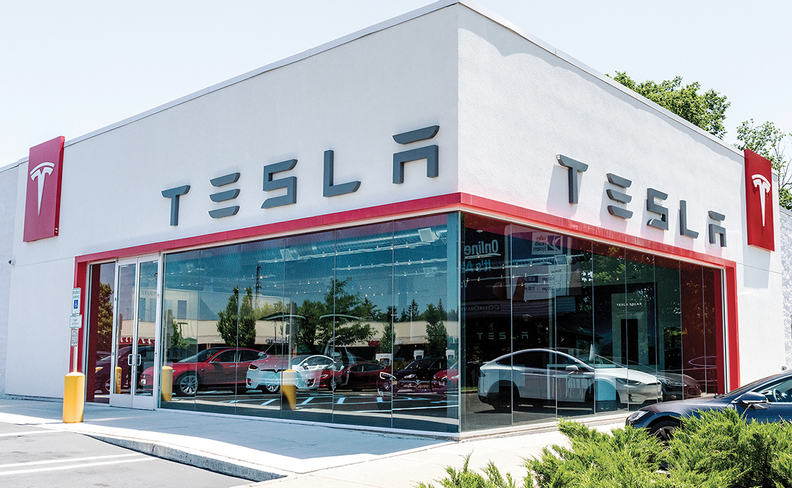 Rather than taking Musk's bait for another public tussle over franchise laws, dealers are using a wait-and-see approach. The fine print is still missing from Tesla's online shift, so it may be premature to speculate on the legal machinations necessary to ensure the company complies with franchise laws. And many feel the "online only" distinction of Tesla's sales shift is somewhat overblown. "Go online right now, and you'll see that there is hardly a franchised dealer in the country that isn't offering online sales and financing through their websites," says Jared Allen, spokesman for the National Automobile Dealers Association. "But the reality is, the vast majority of consumers want to do some combination of both online and traditional shopping for new vehicles." Franchise laws aren't the only potential thorn in Musk's side. Licensing requirements in some states require brick-and-mortar sales locations where sales can be documented and "wet signatures" applied to contracts. Lemon laws, in some cases, mandate a physical presence so customers have a place where they can return vehicles — perhaps a key point since Musk is touting a 1,000-mile, seven-day, no-questions-asked return policy for online-only sales. Musk may be itching for another fight against franchise laws. But if anything, his pullback from physical locations might illustrate why it would be difficult for established companies to follow his path. "The company-owned store model exposes why independent franchises exist today and why other carmakers can't easily get away from them," said Mike Ramsey, senior research director at global technology consulting firm Gartner. "Dealers take on big risks, borrowing millions of dollars to build dealerships. The laws in place to protect dealers are really there to insulate them from actions that could capriciously hurt their investments." Fixed prices, strong brand give Tesla an edge. On the other hand, a newer brand such as Rivian, the maker of an all-electric pickup and SUV, might be enticed by a path that avoids franchised dealers. "I could see them taking the same route with factory-owned stores or an online-only model," said Morningstar analyst David Whiston. "They see Tesla not franchising, so they will think they can do it, too." In October, Rivian founder RJ Scaringe said the company wants to directly control the consumer experience and that circumventing franchised dealerships will be a part of its strategy. Another all-electric newcomer, Chinese brand Byton, eschews an online-only sales approach. When it launches in the U.S. toward the end of 2020, executives say, physical locations will be an essential part of the business model. But there are lessons that Byton has learned from watching Tesla, which will influence its approach. Like using fixed pricing, for example. "Right now, there's not a lot of transparency, and customers have to go from dealer to dealer and compare packages," says Jose Guerrero, director of Byton's go-to-market strategy in North America. Byton will use fixed pricing, he said. Byton will not use franchised dealerships. Instead, it will utilize a "hybrid approach," as it does in China, in which it runs some galleries and showrooms on its own but further establishes retail partnerships that help quickly anchor the fledgling company in local markets. Guerrero says the company wants one or two major retail partners in the U.S. In some cases, Byton will operate its own galleries that function as flagship brand centers, like Tesla. In others, the retail partners will operate similar centers but further offer test drives, sales and services. In both cases, Byton wants a consistent brand experience for customers. In that sense, Byton respects the path already blazed by Tesla. "Tesla is not crazy," Guerrero said. "They have 10 years in the market and their own charging network, which you can look at as part of their overall marketing. There's been a lot of focus on the elimination of stores, and not the brand-building that Tesla has achieved to this point." Though the remaining stores will have vehicles available for test drives, will those customers who can only access a vehicle online warm to the idea of buying a car without kicking the tires first? If 80 percent of Tesla buyers represent a slice of the market that, as Musk said, already forgoes a test drive, does Tesla risk losing the remaining 20 percent who want to compare the all-electrics to other luxury vehicles? At the same time, as Tesla steps into uncharted territory, as Jonas said, it would be foolish not to account for the fact that the Amazon age has arrived. The online behemoth raked in $258 billion in retail sales in 2018, according to eMarketer, and shifted sales of every conceivable consumer good toward an online sales-and-delivery model. Shopping malls have been gutted, and physical retail outlets have faded from the American landscape. But even Amazon, with its Whole Foods grocery chain and Amazon Go convenience stores, has a physical presence. "They have gotten into figuring out how to create a physical presence to complement online," Bradley said. "And what's important to remember is that whether it's a physical presence or online, convenience is still king." Tesla may be the ideal brand to implement an online-shopping experience, in that it has fixed prices and a highly distinctive, valued brand. It would be the latest way in which the company has forced the auto industry to evolve, as it did with the introduction of highly desired EVs and pioneering, over-the-air software updates. On the other hand, Tesla often has presented a grand vision and struggled with more practical considerations, such as its well-derided "production hell." But it looks like the right ingredients are there for success. "They have consumer demand for their product and a fixed-pricing model," Bradley said. "The value proposition is there, no question about that. I think the logistics in delivering and servicing vehicles are the two key areas that Tesla has to get right to remain a viable business." Urvaksh Karkaria contributed to this report.